Aubergines (or eggplant, if you swing that way) are one of a number of fruit and vegetables that have a piss-poor reputation, mostly owing to their perceived lack of flavour. Now I will grant you that aubergines are not the zappiest of vegetables when it comes to it, but then neither are potatoes and yet everyone raves about them. The real benefit of our poor old aubergine lies not in its flavour, but in its texture, in what it can add to a dish in terms of colour and consistency. But above all, you need to know what to do with the damn things, which means knowing a few aubergines-friendly recipes, which are obviously outside the standard range of northern European cuisine. Look south, my friends, to the Mediterranean lands and all will become clear! The mistreated, ill-considered aubergine rises to near-glorious heights in the sunny south! Today we’re going to leave Italy for a while. This is a Spanish recipe (hence the appearance of the Moors in the title), though variants of it exist throughout the Med, all the way across to the Middle East. I love it because it’s bursting with fabulous rich, smoky flavours and it contains my favourite meat of all – lamb. The lamb can be substituted with beef if you can’t get it, though I would suggest you seriously consider changing your butcher if he can’t come up with a few scraps of lamb… Mind you, having said that, lamb and mutton can be extraordinarily difficult to find here in Italy. The Italians are not great sheep-eaters in much the same way as the Irish are not great horse-eaters – they have better uses for the fleecy buggers. The only exception made is Easter, when they eat they eat the poor little blighters at about 1 month old, as distinct from Irish lamb which is about – or just under – a year old. Anyway, lamb’s your man for this dish. Or goat (kid), if you can get it, but that’s maybe pushing it. Now, I have written before about aubergines but for this recipe you will need quite decent-sized ones of the traditional long pear-shaped variety. The dish doesn’t work as well if they’re the round variety and the deep purple ones are better than the white. You’ll also need a few particular spices for this one, spice which are clearly Moorish (North African) in origin and which lend their particular flavours to the overall effect of the dish. They are, however, fairly common on most kitchen shelves – paprika, which should be very deep red in colour (if it’s orange, get yourself some proper paprika and throw that one out) and remember that paprika is not “hot”; cinnamon, preferably still in twig form; nutmeg, which is best grated on the spot and not the already-ground version; cumin, again preferably in seed form rather than powdered, and if possible toasted quickly in a heavy-bottomed pan. Once you’ve gathered together your ingredients and assured yourself half an hour or so of silence by burying your mobile under the sofa cushions and locking the cat in the hot press, we’re ready to begin our Moorish Stuffed Courgettes. Having given them a cold bath and a good scrubbing to get the grime off the back of their necks, remove the top of the aubergines (the bit with the greenery attached) and slice your aubergines in half lengthwise. Now the trickiest part. Using a sharp knife and pretending you are Christiaan Barnard, make an incision just inside the skin going all the way round the inside of the aubergine. Take care not to dig too deep (tell yourself there are arteries down there!) or you’ll break through the skin. Having done that, repeat the operation making a grid pattern throughout the rest of the aubergine. Now do it again with the other 3 half-aubergines. With a bit of luck, at least 1 of these patients might live. At this stage (sadistic bit) you have to rub a bit of salt into the wounds. Be generous with the salt. When that’s done dribble some extra virgin olive oil over the surface and rub it down into the slits together with the salt with your fingers. 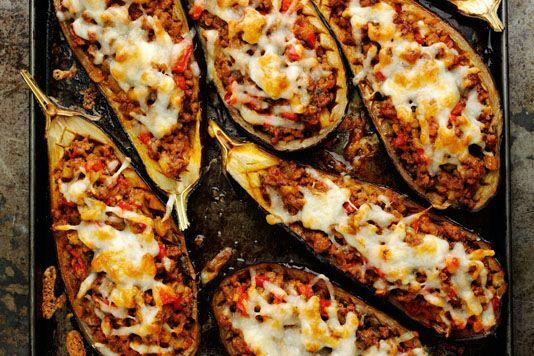 Now turn on your oven to about 200°C, set the aubergines on an oven dish (preferably one where they fit perfectly, leaving no space at the sides for them to wilt over), stick them in and leave them there to sweat a bit for about 30 minutes. Ignore them if they bang on the oven door. It’s for their own good. You can wash your hands now. And have a cigarette maybe. I would. Now dice you pepper. Heat a frying pan with a dollop of extra virgin olive oil and fry off the pepper for a few minutes. Add your onion and garlic and mix through. Then bung in the lamb and stir baby stir, breaking up the pieces of lamb and making sure they all lose their pinkish colour. Next, throw in your cumin, paprika, cinnamon, nutmeg, chili and salt. Keep stirring and mixing. Now add your tomato, mix it in and if, after a couple of minutes, the whole thing seems a bit on the dry side (which it probably will), bung in a dose of white wine. I’d bung it in even if the whole thing doesn’t look dry – you can never have too much wine. Have a glass for yourself while you’re at it. At this stage the aubergines should be dead, so you can taken them out of the oven. You can turn off the oven but close the door as we’ll need it again in a few minutes and we don’t want to waste that expensive heat, now, do we? Using a tablespoon, carefully scoop out the flesh from the aubergines and place it on a plate you will have thoughtfully provided yourself with. Don’t break the skins in your attempts to do this – the idea is to make room, not to remove every single trace that there was ever any aubergine flesh in there. Chop up the flesh on the plate (mind your fingers – it’s still hot!) and then bung the result into your pan with all the other ingredients, mixing it in as you go along. Turn off your pan and start spooning the mixture into the empty aubergine shells (I told you it would be for their own good!). Anything left over can quite happily be eaten on the spot as a reward to the chef or kept by for tomorrow. I’d avoid giving it to the dog, though. He won’t appreciate it and the chili and spices will play havoc with his digestion, with unpleasant results. You can go mad with wine on this one: definitely a vigorous red from the southern coasts of Europe. Here are a few suggestions – French Corbières or Bandol, Spanish Garnacha or even a Chateau Musar or Kefraya Les Bretèches from Lebanon.